Harriet Carter: Kids, Nana, Death, Fun! Happy Harriet Carter Wednesday, or HCW as the kids are calling it. It’s all the rage. Last week I got some hate-mail and nastygrams from some of you who were less than thrilled with me making fun of the little girl last week. Seldom do I allow the hate mail to bother me and this time was no different. Psych! 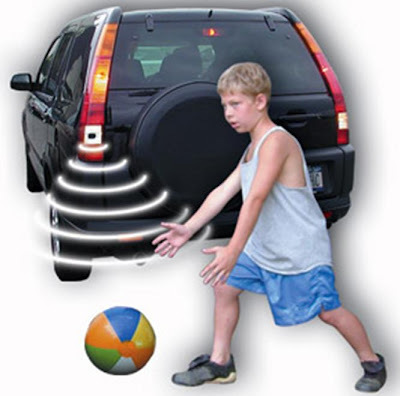 In honor of the nastygrams I’m starting out with this loser kid (below) who’s just about to get pinned down by this SUV. Enjoy! Product # 1 – Beep beep. Beeeeep! Beeeeep Beeeep! Nothing? Oh well, knock this kid the hell down. That’ll teach him! What in the holy hell is this kid doing? First off, is he running to catch the ball or is he doing the ‘Walk Like an Egyptian?” Wait, is he a cardboard cutout? And who the hell is he looking at? Keep your eye on the ball, kid. The ball is on the ground and your hands are about 5 feet higher than the ball….and you’re looking at something else. You totally get picked last in gym class and this, my friend, is the reason why. Well, it’s one of the reasons why. There’s about a list of 15 things and if you really want to know them, email me. Who plays with a beach ball if you’re not in the pool or at a baseball game? What the Christ is wrong with his right foot (my right)? Is he wearing a moon boot? Did he twist it completely around? Why can’t I stop asking questions? It’s like a disease. Anyway, this tool bag deserves to get a little “hug” from the SUV that’s backing up solely for the reason that he has “sock tan lines.” Anyway, if he can’t hear the car backing up perhaps he can see the 6 white lines that are beaming into the air. Although, the white lines may be blending into the white street that he’s standing on. Yeah, I bet you like everything in life white, Jimmy, don’t ya? Racist. That explains that sock tan lines. Beep beep! Product # 2 – Night night Nana! Say goodnight to Grandma, kids! She’s just about ready to take the ultimate dirt nap so you better kiss her hairy lip goodbye now. At least she looks happy to be going and she has a smile and a face full of makeup on to prove it. Just keep zipping it Nana, just keep zipping it! Kids, go and pick out your best tie and your best dress and shine up them shoes because Nana just invited you to a party! No no, there won’t be a pinata or pin-the-tail on the donkey, but there will be coffee cake, some candles, and you’ll get to poke at Nana while she’s laying down inside a very fancy cherry coffin. “Yes” that is a nice cherry finish on the coffin. Nothing, but the best for Nana! 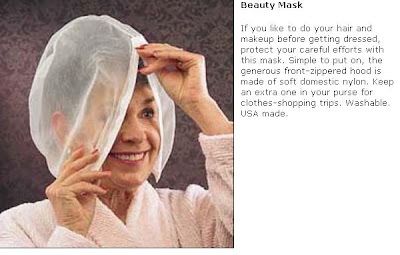 Seriously, way to teach kids how to place bags over their heads and faces. Don’t try this at home….unless your the kid in the first photo above…then give it a whirl. Night night Nana! I’ll be in touch via my Ouija Board! Product # 3 – Are you a mom always on the run? Are you tired of putting your baby in a baby carriage like he’s an animal? Well you can finally graduate from those “caveman” days and live in the future (like the Jetson’s) with your very own baby transporter bag, apparently. You know, it would help if they clearly labeled these photos as “before and after” because I’m a little confused. Now did she carry the baby in the bag and then get to her destination and then take him out…or the other way around? Regardless, I think this is an innovative piece of baby transportation and I applaud the designer. Hopefully they left some holes in the top so the baby can breathe, but if not I’d assume just pack a couple of steak knives with the baby and let him stab some holes when he feels the need. Trust me, he’ll know when he needs it. In case you can’t tell my sarcasm, this is a horrible horrible idea. Who’s buying this? Give me your name, your mother’s maiden name, and the last 4 digits of your social security number. Trust me. Product # 4 – Yes folks, it’s just that easy. Harriet is making planting pumpkins fun and animated. 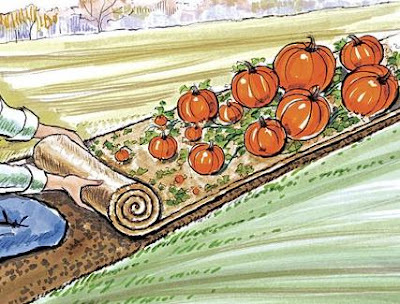 All you need to do apparently is roll out this cartoon loom (seriously, 50 extra bonus points for me using the word “loom”) and VIOLA, pumpkins! From the looks of it you don’t need to plant any seeds or water anything because as soon as you roll this out there are instant cartoon pumpkins of all shapes and sizes. The only issue is that apparently you too turn into a cartoon. This is retarded. What must it be like to work in the “Harriet Carter Brainstorm Room?” I picture about 6 people in overalls, chewing hay, shooting guns off in the air, drinking moonshine, and dropping acid and then coming up with new ideas for the catalog. If this product worked so well, you know what, I want to see the real thing. I want the actual photo of the real pumpkins that developed from this. And, you know what, then maybe I’ll send you some real money, because if this is all you have to offer then I’m totally paying you in some cartoon currency I created. No really, once you receive it just add a little water and VIOLA you’ll have real US dollars and I’ll have real orange pumpkins. It’s a fair trade. P.S Harriet you are a whore, but you clearly are spooktacular! Well, my friends, that concludes another weekly installment of Happy Harriet Carter Wednesday. Be sure to spread the word. Additional nastygrams need not apply. Void in Idaho. Become MYSPACE Friends With IBBB and Share You Harriet Carter Fantasies! Click Here to Join the IBBB MYSPACE Page!